Cord End Caps and Crimps are used to finish off cords of every kind – some can be crimped, and other glued onto the cord with a strong glue such as Super New Glue or Aleene’s Jewelry & Metal Glue. 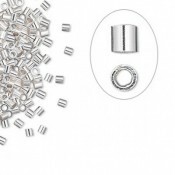 Crimp beads or Tubes are used to secure the ends of your beading wire or cord – they are little tubes or beads that are squeezed flat or folded with crimping pliers. Crimp Covers are a nice way to cover your crimps once they are secured to give a professional finish resembling a spacer bead.